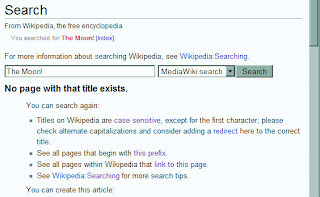 Illogiblog - The Illogicopedia weblog: Wikipedia denies existence of The Moon! It's true! They don't have an article on The Moon! No such nonsense at Illogicopedia, who have no problem accepting the existence of The Moon! What's more, WP instructs me to return to The Moon! Who do they think I am, Neil Armstrong or something? "No such nonsense at Illogicopedia"